When I learned of this week’s Grapefruit Crab Salad for French Fridays with Dorie, I banged my head on the desk. I just came back on Wednesday from South Florida, the land of citrus and stone crab. I can’t believe I managed to miss a golden opportunity to create this ingredient-driven salad when the best that money can buy was just around the corner! My disappointment was quickly set aside though because Greenspan’s recipe inspired something equally delicious yet much friendlier to the wallet. 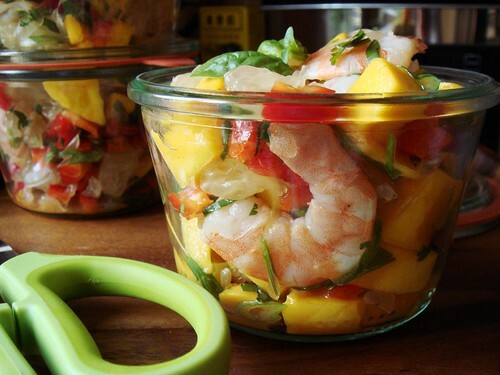 I want to share with you my recipe for Pomelo Mango Shrimp Salad. Lump crabmeat is a luxury item and spending oodles of money on pasteurized crabmeat in a can up here in Ontario makes no sense to me. Poached shrimp is a great seafood alternative without breaking the bank. Pomelo is my trusty standby for citrus salad. If you read Greenspan’s direction for segmenting and drying grapefruit, I’m sure you’ll agree with me on my choice of citrus. Pomelo tastes like a sweeter version of grapefruit yet the pulp is sturdy enough to be broken into chunks without spilling juice all over the place. I also prefer its crunch. This native southeast Asian fruit is commonly used in Vietnamese and Thai cuisine. I decided to take my salad down that culinary direction with addition of sweet champagne mango, cilantro, scallion, and basil tossed in an oil-free dressing made with fish sauce, lime juice, rice vinegar, and Sriracha. It’s a refreshing combination. After five weeks away in sunny Florida, I’m home! I’m home! I’m home! Traveling for a food lover often means bringing home edible goodies. Florida may not come to mind as a gourmet mecca but I still made plenty of worthwhile purchases. Nestled between all the dirty and clean laundry, I packed jars after jars of preserves I made from local Florida fruit. There is also a nice bottle of Estrella Damm Inedit which was introduced to me by friends in Austin last year. Of course, who can forget to buy some Biscoff speculoo spread in both original smooth and chunky? I also brought back various baking ingredients which may be deemed as waste of luggage space. My pantry in Florida left me with half used bottles of Nielson Massey vanilla extract, instant espresso powder, Droste cocoa powder, Pomona universal pectin, rapid rise yeast, and desiccated coconut chips. I’d be the first to tell you these are all ingredients I can source back home but they are also quality items I use on a regular basis. It would be a huge waste to throw them away so I packed them anyway. I’m flying home tonight after extensive training in Fort Lauderdale. Despite being extremely cautious for the entire trip, I crashed while skating twice in two days last weekend. You can say ouch alright! The casualties include scraped elbows, knees, right bum, right shin, right thigh, and two bruised & swollen knees. Ice packs and elevating my legs both help to control the swelling but there is only so much I can do. Bending my knees became a chore and at times I can hardly straighten out the joints due to excessive swelling. Such is the not-so-glamorous life of being a skater. Despite of a couple of unintended meetings with the pavement, I had a good time last weekend training with my teammates at our annual team training camp. The strawberry jam, blood orange marmalade, oatmeal raisin cookies, and pecan brownies were heartily enjoyed by all. I tried a different brownie recipe from my trusty standard. Guess what? I think I have a new favourite! This David Lebovitz recipe originated from Robert Steinberg, the founder of Scharffen Berger. Of course I made it with Scharffen Berger 70% dark chocolate. Let me tell you, all the superlative and praise for this brownie recipe are well-deserved. 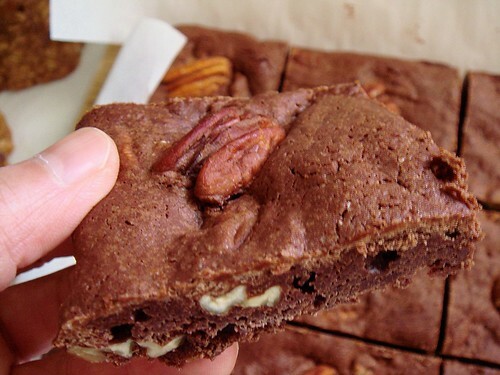 Every bite of moist tender brownie burst with deep dark chocolate flavour and mellow sweetness of Georgia pecans. I cannot wait to make it again for friends back home. I am not unfamiliar with death and grief but the passing of a wonderful friend last weekend brought me face to face with the reality of grieving through social media. Friends from past and present all came out of the woodwork to post remembrance and condolence messages on his profile. 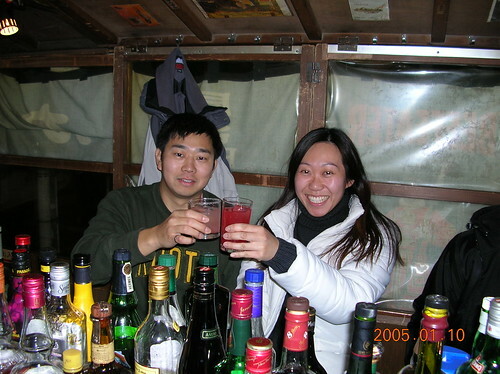 There were poignant sentiments expressed by friends he made from different stages in life. He touched the lives of many of us as mentor and friend. It was unanimous that his smile and upbeat attitude changed us for the better and he will be sorely missed. I posted a message as well. I read every message on his wall and was deeply touched by how my friend made the world a better place. Just learning the positive impact he made upon all of us lessened the sadness of his passing a tiny bit. I knew my friend as colleague, softball teammate, fellow food lover, travel buddy, and gingerbread house architect extraordinaire. But he was so much more. He was mentor to countless fresh graduates breaking into the corporate world. 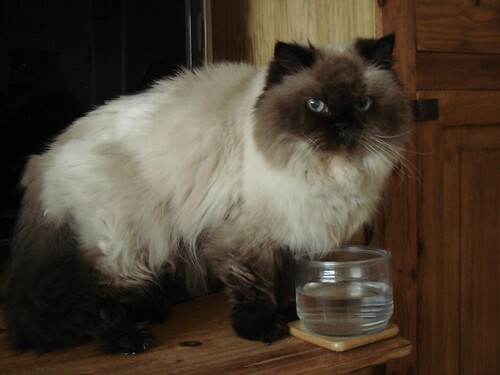 He was father to two very young daughters. He was devoted husband to loving wife. There has been no shortage of goodies coming out of my borrowed sweet kitchen in Fort Lauderdale. Not only did the food curb the cravings of my sweet tooth (and a wee bit of homesickness), there are also enough to go around to share with friends old and new in Florida. 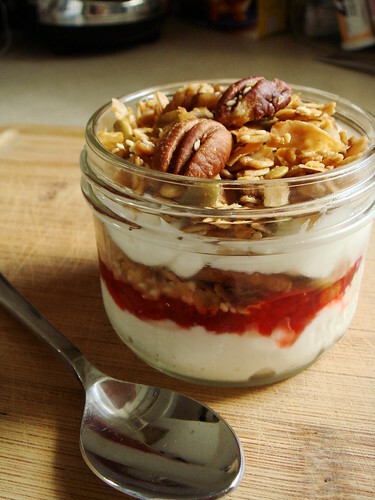 Last weekend, I sent a little brown paper bag with some homemade granola and strawberry jam to a new friend so she too could enjoy this luscious breakfast parfait I love so much. Breakfast is by far my favourite meal of the day. Egg dishes of any kind, dairy galore, and steaming cups of aromatic coffee, need I go on? Of course there are also special occasions calling for special breakfasts that are just dessert in disguise. Those are my absolute favourites though I don’t indulge too often. Gotta keep my girlish figure (well, no. Actually any extra weight just slows me down when I climb hills on skates. That’s the true and practical reason behind the weight obsession.). I’ve written more than once about my love for homemade granola and how dangerous it is for me to be home alone with a fresh batch. Considering all the tough training I’ve been through in recent weeks, I earned my granola. Not just any granola, mind you. This is a recipe lauded by many including the team at food52 and food writer Melissa Clark. Yup, I joined the bandwagon at last and I too want to rave about Nekisia Davis’ Early Bird Granola. This Sour Cream Chocolate Cake with Espresso totally hit the spot. Do you remember the ubiquitous McCain chocolate cake from the frozen food aisle? The size and shape of my cake reminds me of this grocery store staple. When it comes to taste though, there’s no comparison! Think chocolate. Deep, rich, dark chocolate. The cake was moist and tender with a bit of tang from sour cream. It even keeps very well because of honey in the cake and frosting. Excuse me while I go for another slice. 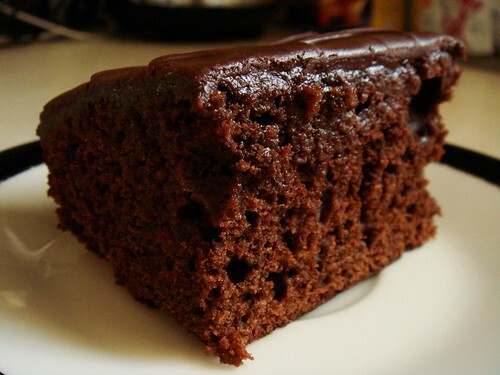 Chocolate cake for breakfast sounds like a good way to kick off Friday. 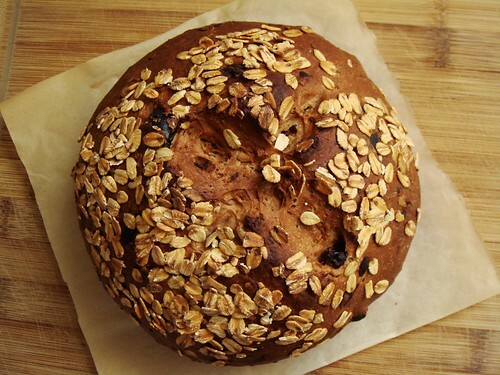 The nutty taste of wheat berries is a characteristic I associate with winter. Stew, braises, and soup are obviously comfort food in cold weather but chewy toothsome wheat berries salad also qualifies as comfort food to me. However, given the right accompaniment, this whole grain salad can easily transition from hearty winter fare to light refreshing spring meal. 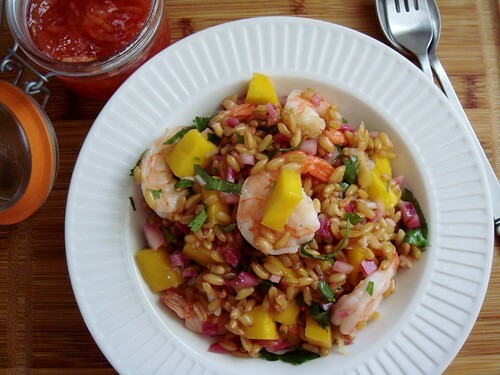 I present you Mango Shrimp Wheat Berries Salad! Basking in the balmy warm weather of South Florida has me craving for quick and light meals. Ideally, it is something I can eat directly out of the fridge as soon as I return to the apartment from working out. The beauty of grain salad is that they can be dressed and stored in fridge with no worries of wilting. In fact, the flavour improves when grains and dressing mingle with each other for longer time. My latest creation pairs wheat berries with shrimps, mangoes, red onion, cilantro, and mint in a blood orange marmalade sherry vinaigrette. Optional mix-in of arugula and coconut chips add a nice crunchy contrast. This is a story of a field trip inspired by ten empty canning jars. My impromptu marmalade making left me with ten brand new half-pint jars that begged to be filled every time my gaze fell upon them. In a moment of brilliance, I started looking up information on South Florida strawberry farms in hopes of filling the jars with farm-fresh strawberry jam. It did not take long before I came upon information on Redland, Miami’s countryside. Last Saturday, I armed myself with a few addresses and set out on a little road trip after I wrapped up training at Key Biscayne. My search for strawberries brought me to Burr’s Berry Farm. As one of the best strawberry growers in the area, Burr’s supplies their excellent berries to some top restaurants in Miami. I chatted with the gracious owner who told me of the different varieties of berries they plant. His personal favourite Sweet Charlie did not fare well this year but the currently harvesting Chandler are big, juicy, and flavourful. I took a leisurely stroll through the hydroponic field with their shoulder height planters surrounding me. 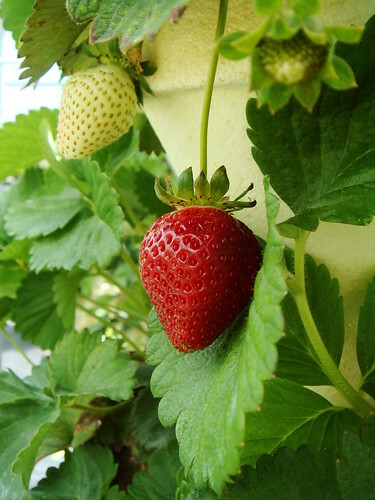 I took a deep breath and was instantly enveloped by the sweet smell of ripe strawberries. This was an experience unlike any strawberry farms I’ve been to because the shrubs are typically too low to the ground for the fragrance to travel up. Behind the rows of strawberries, Burr’s also plant a vegetable garden laden with lettuce, cauliflower, sweet peppers, peas, and tomatoes. Just looking at the harvest was enough to make me smile. I left the farm with a whole flat of the most gorgeous strawberries. There was another reason I could not wipe that smile off my face when I visited Burr’s. 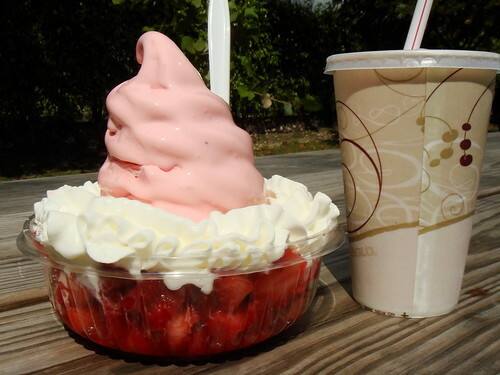 Their famous strawberry milkshake and strawberry shortcake were my well-earned post-workout recovery meal! I’ll simply let the photo do the talking. How do you tell I love canning a little too much? Here is how. When I packed for my month-long sojourn in Fort Lauderdale, I included a few kitchen essentials since I anticipated some simple cooking to keep my living expense in check. By simple, I had every intention to keep things uncomplicated. Perhaps a couple batches of cookies or brownies for a treat but nothing ambitious. As I became more comfortable in my daily schedule, the temptation of the gorgeous local fruit grew ever stronger. Finally, I broke down and bought a few organic blood oranges. At first I mistook them for clementine because of their diminutive size. But upon closer inspection, they were unmistakably blood oranges with their deep crimson glow. I ate one and was immediately seduced by the sweetness. I knew right then that I had to make marmalade. Can you think of a better souvenir for a canning enthusiast? 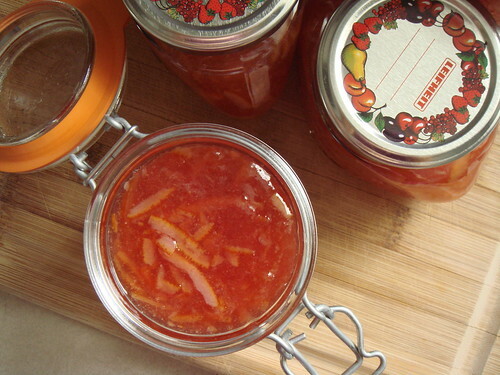 A few months from now, when I open a jar of my own marmalade made from in season local blood oranges, I’m sure it’ll be the most vivid reminder of my time here in South Florida.